Universal Tongue was first shown at The Medialab part of Cinekid Festival in Amsterdam from 17-26 October 2018. The MediaLab is a 1200m2 digital playground where children can learn in an active way about the possibilities of different media. Twerking, popping, the moonwalk or the Macarena - all dance styles can be found on millions of videos on YouTube. Approximately 300 hours of video are uploaded to YouTube every minute. Artist Anouk Kruithof is fascinated by these dances as forms of self-expression and empowerment, which are now available everywhere through the internet. She researched how dance has developed as part of our media culture globally throughout history and manifested itself online, mostly through platforms like YouTube and Instagram, and repurposed found footage to find an interwoven common ground as a shared visual language. 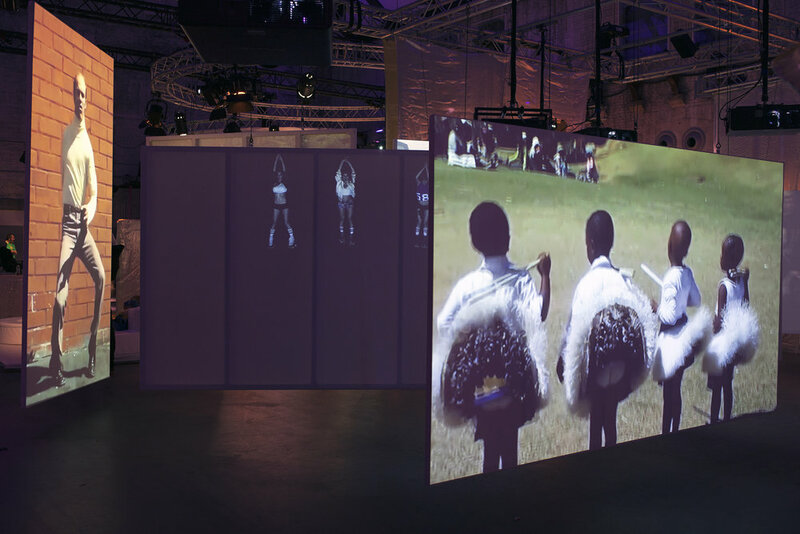 This multi-channel video installation offers an opportunity to reflect on the various ways dance is in fact a universal language of sorts, defined and deployed by various subcultures, virally distributed across nations, cultural boundaries, continents. With a research team of fifty people, scattered across the whole globe so as to best represent insights from the globalized world from each corner of it, Anouk Kruithof sheds a light on how dance is indeed local, but certainly global to be mesmerizing as a token of the very concept of indi- viduality, diversity and culturally kaleidoscopic representations of what we understand to be current, of the now. Universal Tongue proposes that, however crazy we get over internet crazes, the traditional dance as a token of cultural identity on a medialized global stage is far from being diminished in cultural relevance by the digitization by global media platforms. It’s value becomes, even, more present and thus more relevant than ever by its visibility on a global scale. Viral media is about fads. Dance as a universal language spread online shows us there is more, far more to dance, than just that fad of the moment. Over 8800 dance-videos were collected from Youtube and Instagram with a team of 50 researchers located all over the world. Each researcher received a symbolic fee of 1 euro per delivered video. Researchers also submitted small texts about the dance-styles being represented in their found videos. The total length of all this found video material was 250 hours. After the rough-cut a total length of 80 hours remained. The final video installation consists of 8 channels (dimensions variable) with 8 films that have a duration of 4 hours each. A dance-conclave through the jungle of the internet, Universal Tongue shows 32 hours of completely mixed mesmerizing video presenting 1000 dance-styles from all over the world!